During the height of the Facebook privacy scare this past May, a group of four computer students, who also happened to be friends, got a lot of attention from the social networking world by asking for some funding to work on a decentralized social network they planned to call Diaspora. The New York Times ran a profile on them, and thanks to this their original goal for $10,000 in funding turned into them getting over $200,000 in donations from over 6,000 people (disclosure: I was one of the 6,000, but there are no financial gains to be made from my funding). 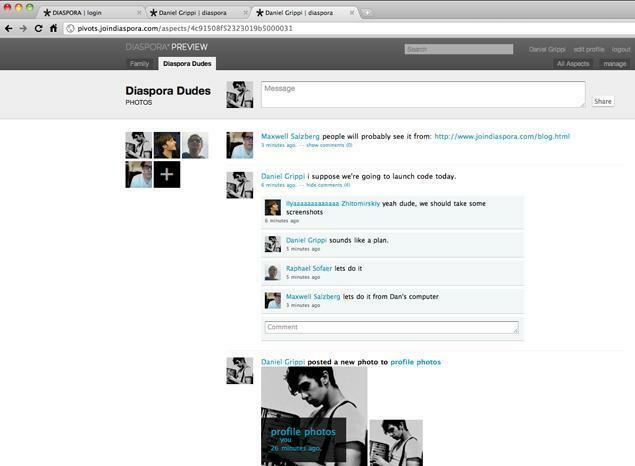 Once the funding was finished the guys got to work, and while they updated supporters through out the process, we had nothing more than a few screenshots to prove anything was actually going on. While there was no reason to not believe they would deliver, you did have to keep a weary eye on them until they delivered something. Well, yesterday they kept good to their word, and the source code has been made available to anyone who wants it to see what they can do with it. Here is a screenshot as the network appears now. Friend people across the Internet no matter where Diaspora seed is located. Development by the core team is not stopping at this point. The four designers plan to add Facebook integration and full data portability by Oct. when they go to an Alpha release. The currently released code isn’t anywhere close to being a production release for full consumption, but it is an important step in that direction. Will Diaspora unseat Facebook? I highly doubt it as the privacy concerns have been pretty much forgotten by most people already, removing some of the motivation people had to run to this project. It also sounds like the service is not going to be something your parents and grandparents can just join on a whim like they’ve been able to with Facebook. Yes, the planned Facebook integration may allow you to move over easily, it still won’t be as streamlined. I still believe in the project, and I look forward to checking it out, but I still think this is going to be pretty niche. What say you? Are you excited for Diaspora?